The European Space Agency's sun-watching Proba-2 spacecraft recorded a video of the annular solar eclipse that took place on January 15, 2010. A spacecraft in Earth orbit recently captured a rare view ofa solar eclipse from space. During a solar eclipse the moon passes between the Earth andthe sun, and when the three are perfectly aligned, the sun's disk is blockedout by the moon. The sight was witnessed on Earth by people across Africa andAsia on Jan. 15. The view from space, meanwhile, was captured onvideo by the European Space Agency's sun-watching Proba-2 spacecraft. The probe, which was launched in November 2009, carriesscientific instruments to monitor the sun and space weather. The Jan.15 eclipse wasn't a total eclipse, when the moon is the right distance fromEarth to block out all of the sun's face. 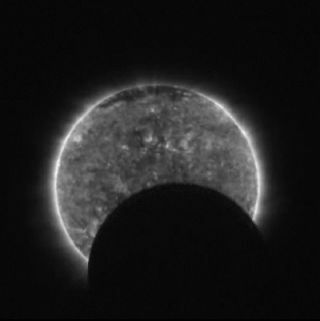 In this case, called an annulareclipse, the moon was further away from Earth, and so blocked out less of thesun's disk. With a maximum length of 11 minutes, 8 seconds, it was the longesteclipse of the millennium so far. To study the event, India launched a fleetof small rockets to see how the drop in sunlight as the moon blocked partof the sun affected the Earth's atmosphere.